Utilization planning can be almost as important as resource planning itself. As a manager, you have to make sure that the utilization of your resources is optimal in short- and long-term. Ganttic is a resource planning tool that features resource utilization percentages that are calculated according to the time period that is open in the Gantt chart area, capacity utilization graphs that indicate the utilization in a time period visually according to the rules that you have set, and resource group utilization percentages that reflect the utilization of your resources per groups that you have created using custom data fields. In addition to that, Ganttic features task timing tools that you can combine to plan tasks the way that makes the most sense for you. Resource utilization percentage is calculated according to the time visible time period in the Gantt chart area. Resource group utilization is calculated in the same way as the resource utilization percentage. The date and time when your task is planned to start and end. It's the most basic way to plan tasks. Simple drag and drop scheduling. You set the duration with start and end date, busy time will be calculated according to the utilization percentage you set. The number of days and hours your task is planned to take. You set the task duration in days and hours, add the utilization and the end date and busy time will be calculated for you. 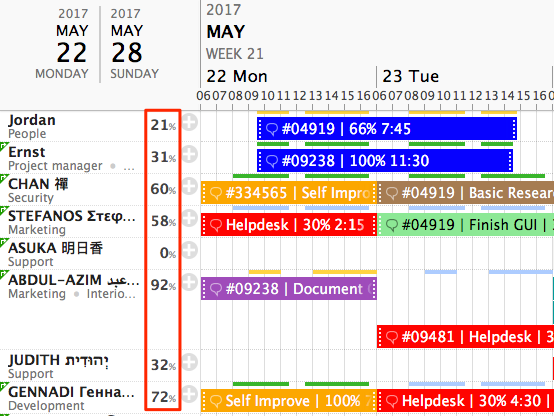 You can set the task duration in days and hours, add the utilization and the end date and busy time will be calculated for you. For example, if you know that the task is supposed to start two weeks from now on a Monday, and it's supposed to take 45 days, plan using duration. If you know that the task must be finished within two weeks, toggle the switch between the start and end date, and the start date will be calculated for you accordingly. The number of hours and minutes of the business hours the task is planned to take. 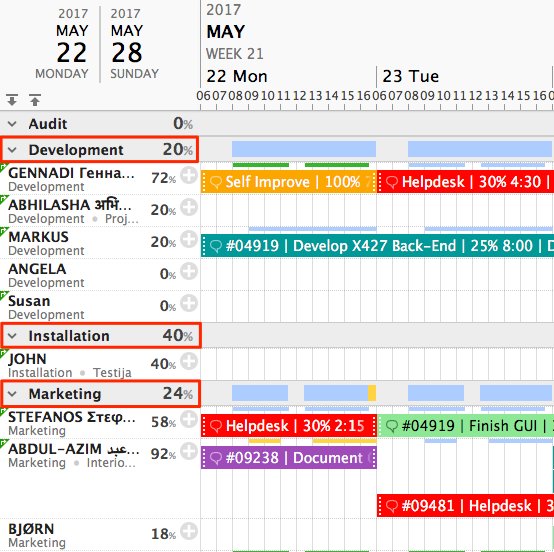 Using the busy time to plan tasks is useful for you if, for example, you want your resource to be busy with a task for 40 hours but you want the utilization to be 50%, choose a start or an end date and the rest is calculated for you. The percentage of business hours the task is planned to take. As explained before, task utilization percentage represents the number of business hours the task is planned to take. Use task utilization percentage to optimize concurrent tasks and to make priorities. Did not find the answer to your question regarding resource capacity planning?